Got questions about how to tell real news from fake? Come to a short workshop at the Birnbaum Library to learn about the fake news trend. 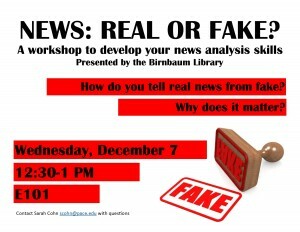 We’ll go over tips to help you develop your news analysis skills. Don’t get duped! Wednesday, December 7, 12:30-1pm, E101 computer lab. Contact Sarah Cohn, scohn@pace.edu with questions. This entry was posted in Uncategorized and tagged Birnbaum, Fake news, Research, Workshop by bplanncurley. Bookmark the permalink.